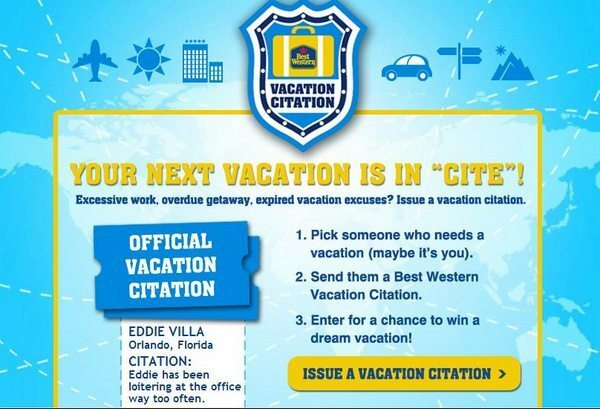 Best Western has a fun Vacation Citation contest on their website where you can issue a “Vacation Citation” to friends and family members who you feel need to go on vacation! Grand Prize winner will get a dream vacation which includes a five night stay at any Best Western hotel in the world, round trip airfare, gift cards to use on vacation and more. Avis rental car vouchers and AAA/CAA memberships. Do You Use Your Vacation? Best Western and Wakefield Research found that more than half of all US Travelers find it hard to use all their allocated vacation days. My goal is to not let a single vacation day go unused! I turned down an offer from Amazon to work with another Fortune 500 company which not only had a more generous vacation policy, but which also encouraged employees to use ALL their vacation time each year. Sure, Amazon gave employees a small stock grant and higher pay, but I knew that I’d be unhappy with only 2 weeks of vacation in the year. The trade-off was certainly worth it for me! Best Western also found that 55% of all employees can’t go a week without checking email, and I’m guilty of this. But checking my email once a day – in the morning or night – actually made it easier for me to go on vacation. That’s because folks at the office know that they don’t have to cover for my emails and I have less to do when I do get back in the office. Best Western is offering a $100 gift card to a lucky Million Mile Secrets reader! All you have to do is leave a comment, on this post, answering the question “Do you use all your vacation days?” BEFORE 9:00 pm CST on Friday, March 15, 2013. I’ve always had an “academic” year–with summers off, so yes, I use my vacation. My idea of the ideal job–Saturdays, Sundays, June, July and August–all off! I get a paltry two weeks per year and it’s use-it-or-lose it, but that part doesn’t matter because I have to cunningly ration it out and plan along for my trips to coincide with company holidays and weekends to get even the basic world travel in that I want to do. Typically this means about two decent “overseas” trips per year (counting a cruise or resort stay somewhere in the Caribbean). We can also get 4 “comp days” for being on-call, and as much aggravation as that is, I use them all up too. If I could only buy vacation days or take unpaid leave I’d do that. All in all, I think I need to contemplate going self-employed again; I just have too much wanderlust for a FT desk job! Yes! Our days do not roll over to the next year so it’s use them or lose them. And I use them all. 10:20 amMarch 15, 2013 Workaholic? At my current company we get 2 weeks a year and no personal days, yet I am not always able to use all my leave due to workload and other factors. Taking more than a week can be difficult, and like many, I find myself checking in while on vacation. I am US Midwest-based and did check in with work even from NZ and from OZ when on vacation there. But then so do my boss and most of my colleagues check in even when traveling on vacation. I questioned my sanity for checking work email from the free wireless from the Te Papa museum in Wellington 🙂 Great city, and great museum BTW.